Thanks to Nina Douglas at Indigo for providing a review copy in return for an honest review! Neva keeps a list of The Missing - the people like her grandmother who were part of her life but who have now vanished. The people that everyone else pretends never existed. In a nation isolated beneath the dome of the Protectosphere - which is supposed to protect, but also imprisons - Neva and her friends dream of freedom. 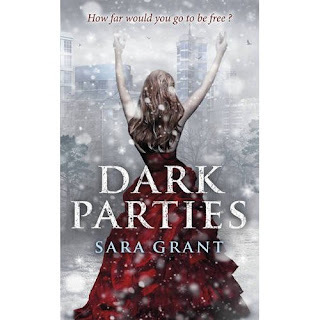 This dystopian is Sara Grant’s debut novel, and it’s pretty impressive! I was first attracted to the striking cover artwork – the gorgeous red dress stands out from the grey and slightly foggy/snowy background which illustrates the whole premise of the book wonderfully; people are unique, we don’t all need to blend in and merge into one mass product. I found this to be one of the most unpredictable books I’ve read this year. There are so many twists and turns which keep on going until the very end. Even if you guess some of the twists, I doubt you’ll guess them all! Although a fairly satisfying ending, the book is very much left open for the possibility of a return. I’m very much hoping for a sequel – I want to know more!!! I felt the same way about this one, absolutely loved it but definitely want more. If it doesn't happen though I'd settle for more from the author, she is fantastically talented!